In our continued look at recent developments in the fantastic field of food, we report on this East meets West case involving two restaurants using similar names for their outsized sandwiches. Defendant Heart Attack Grill (HAG) in Jack Lebewohl et al. 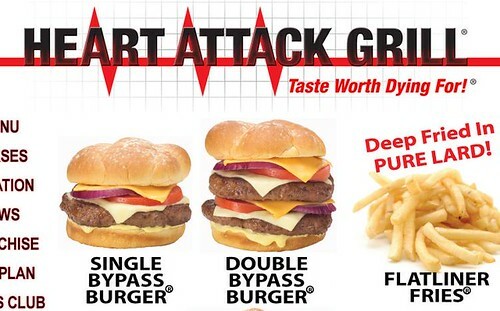 v. Heart Attack Grill, LLC, is not exactly known for its low-cal menu. At its Las Vegas location, HAG serves up “Single”, “Double”, “Triple” and “Quadruple” Burgers, the latter clocking in at 8,000 calories, with four half pound beef patties. In fact, guests at HAG weighing 350 pounds or more eat free. Plaintiff (the “Deli”) uses the name “Instant Heart Attack Sandwich” for two large potato pancakes enveloping corned beef, pastrami, turkey or salami -- a true delight for the deli aficionado -- and is also developing a “Triple Bypass Sandwich.” HAG, having palpitations when it heard this, sent a demand letter, telling the Deli to cease using these names because they caused confusion with HAG’s burger names. The Deli, a much beloved tourist attraction in New York, shot back with a declaratory judgment action, asking the court to state that the restaurants’ use of their sandwich names did not cause public confusion. In considering this issue, the New York court discussed the multifactor standard for finding a likelihood of public confusion set out in the seminal case Polaroid Corp. v. Polarad Elecs. Corp.. Holding that most of the factors pointed against confusion, the court found no infringement, despite the use of “Heart Attack” in both names. Geographic remoteness was a factor, as was the difference in the types of customers that the parties served (the Deli’s health conscious consumers versus the caloric-loving populace that HAG serves). An absence of evidence that the public was actually confused between the parties’ names also figured in the decision. Indeed, HAG could have helped its case by commissioning a consumer survey, demonstrating that the public thought the sandwich names were somehow related, but HAG evidently chose not to do so. The court concluded by -- appropriately -- “carving up” the areas in which the Deli could use the “Instant Heart Attack Sandwich” name: It could use this name within Manhattan, including on signage, menus and Internet advertising, but could not expand beyond Manhattan. As to the Triple Bypass Sandwich, the court granted the Deli’s motion that it could use this name, but only in a limited manner on menus (but not signage) pursuant to an agreement between the parties. According to the court, the parties could have saved themselves a lot of heartache -- and legal fees -- by negotiating on their own rather than coming to legal blows, because they wound up essentially where they began, especially as to the Triple Bypass Sandwich. So, next time you bite into that pastrami on rye, realize that it might become the subject of a legal dispute.